git did not exit cleanly (exit code 128). Any help or guidance will be well appreciated. You can choose to ignore the server certificate (at your own risk!). Configure your TortoiseGit in the following way. First of all open the TortoiseGit settings. Open the global git configuration pressing "Edit systemwide gitconfig"
Security Warning: This is susceptible to Man in the Middle attacks. Be sure that this security concern is not an issue for you before you disable SSL certification verification. All the top answers are really dangerous! Do not disable SSL verification globally! Instead, use the excellent answer in another thread and very selectively allow a self-signed certificate for a specific site. The CRT file itself can be obtained in multiple ways. You can just save it using Firefox, store it somewhere safe and point your config to it. Please check that your Git for Windows installation is correct. As you can see in the screenshot git.exe cannot find the template directory - so I suppose git.exe also cannot find the shipped CA certificates. If that doesn't help, see a description here for including a certificate into the Git trust store. Open Git CMD and run below command. Not the answer you're looking for? 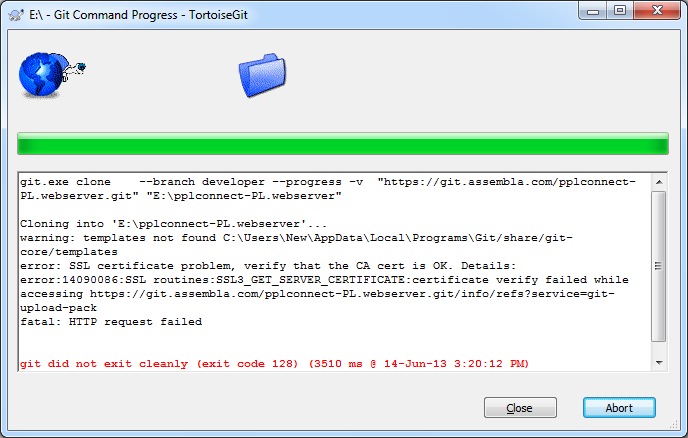 Browse other questions tagged git ssl ssl-certificate tortoisegit or ask your own question.